On the night of Saturday 8th, and into the early hours of Sunday 9th November, amateur astronomers from ESTEC had a good reason to brave the cold out in the Dutch dunes. The Moon crossed the shadow left behind the Earth by the Sun and went into eclipse. This phenomena is well known and quite common. The last one was in May. Most of the amateurs over Europe were frustated, however, because the Sun rose and spoiled the spectacle! 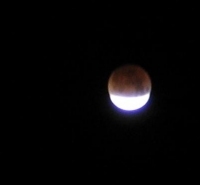 Last weekend, the eclipse happened in the middle of the night and was entirely visible from all other Europe. Except for clouds! We at ESTEC were lucky. 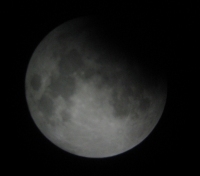 Some thin clouds showed up just as the Moon entered the shadow, but they did not stay long. Anyway, the Moon was too bright to let these clouds hide it. It took more than an hour and a half for the Moon travelling on its orbit to disappear in the shadow. Disappear? Not really in fact: because of the Earth atmosphere, the Sun light is deviated and is still lighting the Moon. But because the red light is more deviated than the blue, the Moon appeared reddish. This makes the phenomena even more impressive. The Moon is not just gone. It is not as bright as usual but it got this typical red and yellow color. This time the Moon was just grazing the inside of the shadow: light was then not far and the south pole of the Moon, was even still white and then more bright than the dark red North pole. Twenty two minutes later the light pop up again on the limb of the Moon and the light spread again on the Moon which slowly regained its full brightness. The stars, except for the brightest disappeared again in the Moon halo. It was time to go to bed and take some rest before the next one visible over Europe - 4th of May 2004.